The new Non Resonated Version of the very popular Milltek Sport Fiesta ST180 Exhaust system. Release the Flow from the new Mk7 Fiesta ST 180 Ecoboost engine with a Milltek Sport Non Resonated Single box Exhaust System. So what is the difference between the two non resonated Milltek Systems ? Well its certainly not the price... the cost of the non resonated vs the Race non resonated is exactly the same. Its all about the internal design of the full flow 70mm pipework . The Race Version has less silencing than the normal non resonated.. The standard non resonated noise level is all taken care of by some very special full bore trickery within the single rear silencer box. Its not about restricting flow, its about reflecting sound waves internally to create a perfectly tuned rear silencer. Which should is choose ? Pumaspeed have more experience in the supply and fitting of Milltek sport Exhaust system to Fast Fiestas than anyone else in the world, we recommend the Race Version be fitted with the original catalyst or the Milltek Sport 200 Cell Sports catalyst, the addition of a decat can make the Race version a little loud. For all decat users we suggest the normal non resonated system which has a little more silencing than the Race version. A decat has the affect of amplifying the exhaust note making any exhaust system louder . With a beautiful engine note the new Ford Turbo 1.6 Ecoboost engine is brought to life with this piece of artwork again crafted by the masters at Milltek Sport. The system features a full 70mm bore size, full stainless pipework and 2 x GT80 style tailpipes. Your investment into the ST180 Milltek Sport Exhaust is fully rewarded with a fully rounded tone and legendary build quality. 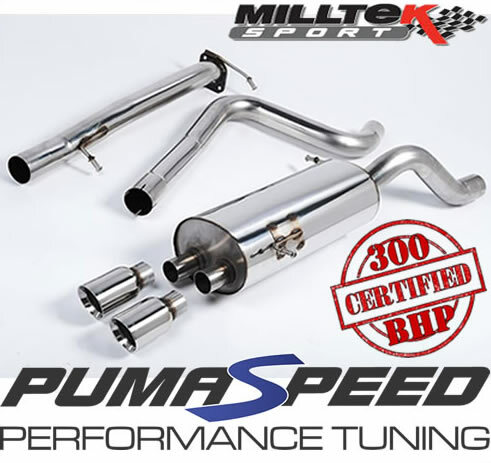 Get ahead of the game with Pumaspeed the Home of the Milltek Sport Exhaust System. The Pumaspeed Workshop team are ready to fit the ** BLACK FRIDAY FREE GIFT** Milltek Fiesta ST 180 Cat Back Exhaust (Non Resonated/Race) in our Head Office located here. We estimate the labour time to be approximately 0.75 hour(s) costing £58.50 inc VAT. Therefore making parts and labour a total cost £531.11 (inc. VAT). Pumaspeed have a specialist distribution team that can dispatch the ** BLACK FRIDAY FREE GIFT** Milltek Fiesta ST 180 Cat Back Exhaust (Non Resonated/Race) to any destination worldwide.